Talk Nerdy To Me: Let's Talk Tablets. With Apple selling 3 million iPads in 80 days it's easy to understand why competition in the tablet arena is heating up. But what we are calling 'tablets' these days is pretty diverse. Expected to be the iPad's biggest competition the Tab will be hitting the States in the upcoming weeks. Samsung made a huge announcement last Thursday that it will live on four major carriers; Sprint, Verizon, AT&T and T-Mobile, allowing the carriers to set the price point, plan and of course tweak for customization (VCast, access to AT&T's Wifi Hotspots, etc). Initially it will only be available with a carrier but it is also anticipated to have a wifi only version taking cues from the iPad. The biggest difference with the Tab is that it runs on Android 2.2 (Froyo) and it has a front facing (1.3) and rear facing camera (3MP) with capability to video conference. It is 3” smaller than the iPad and has expandable memory via microSD slot (up to 32GB). The first tablet made just for college kids – currently in beta testing it will be out by the end of the year. The idea behind Kno is to replace everything in a 20lb backpack being lugged around from the books (now digital) right down to the pens (stylus). This is still in the tablet category but its larger in size and its two 14” panels and weighs 5.5 lbs. The large dual screen viewing makes it easy to work with the device - access text on one side and graphs on the other for example. Kno hopes to have 90% of textbooks available by launch. 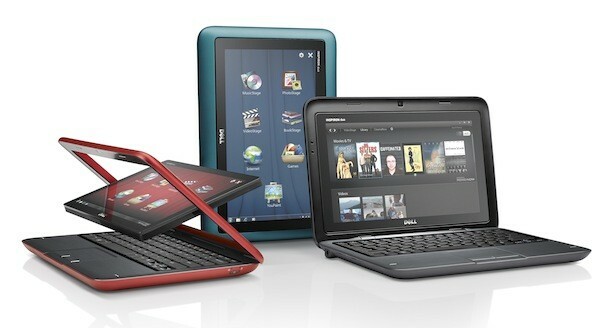 Dell recently unveiled a 10" convertible netbook/tablet unit. Little is known beyond the fact that it will run on Windows 7 with an Atom dual-core processor and is release date is TBD. The big deal is the tablet conversion (and Ill take an Atom processor any day) but guess what - I can make my tablet a netbook too with a Brando. What will it take for tablet success? The tablet is taking the hype of the netbook - though I personally think it is more practical. I still feel it is a want not a need and for that matter price point is huge. Also, we've learned that people don't like commitment and contracts (being sold on a carrier). The iPad is great on 3G because you are only committing month to month. I also think apps are a huge selling point. While the Android marketplace has around 80,000 the Apple App Store is still king with over 250,000. And as a final note - this has not received as much attention but I found it interesting that Google's director of mobile products, Hugo Barra, stated that Android is not optimized for tablets. (The reference is to Froyo - while he stated the next versions of Gingerbread and Honeycomb will be up to par.) See link.